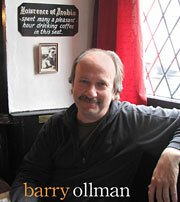 Barry Ollman has been a collector of rare letters and autograph material of famous people for more than 30 years. His special interest in those who spoke for the voiceless and disadvantaged led him straight to Woody Guthrie and he has since built an important archive of Woody's papers, letters and artworks. Collecting Woody is an illustrated presentation, followed by questions and answers, displaying a broad variety of highlights from Ollman's archive of the original correspondence, artworks, books and related ephemera of Woody Guthrie and his circle. Barry's images and stories of the hunt for these cultural treasures make for a stimulating and revealing presentation, bringing new insights and understanding to the Woody Guthrie story. Currently Ollman lives in Colorado where he writes and records his music, works on his collection and does volunteer work for various non-profit groups, primarily arts and music related.